Developers: Scott Patterson & Matt Crysdale of Visual Concepts, Ltd. 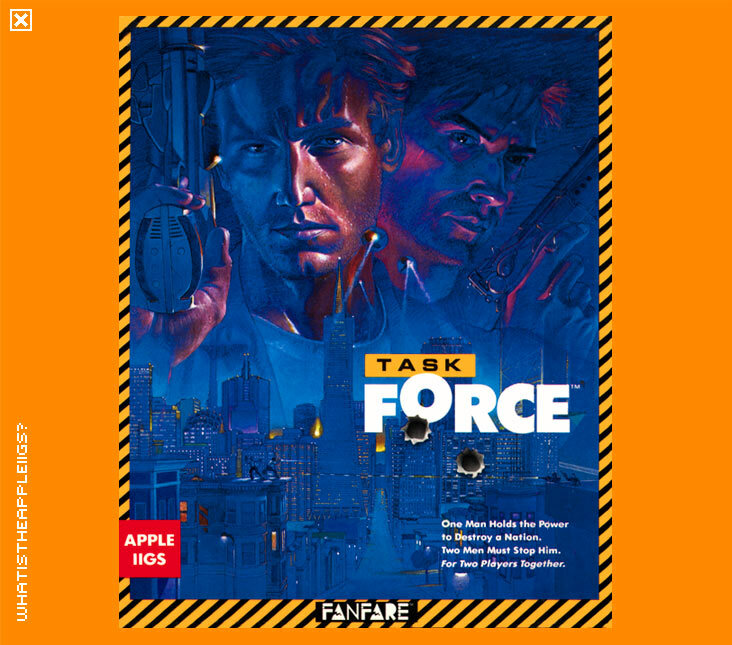 Task Force is a classic IIGS only game, the last original game from Visual Concepts duo Scott Patterson as programmer and Matt Crysdale as graphic artist released in 1990. While gameplay seems as far removed from reality as possible, it's fun nonetheless. It's based on the arcade game NARC including cops, gangs, guns and rocket launchers. Task Force is not a bad technical achievement either, as the game runs perfectly on a stock IIGS running at 2.8Mhz with 3/4 of the screen scrolling with many relatively large sprites constantly running about trying to kill you. Task Force can be played either as a single or simultaneous two-player game (which can get pretty cramped by the keyboard). Player 1 keyboard controls are A = move left, W = move up, D = move right, X = move down (you can figure out diagonal keys from this) and open apple is the fire button, option makes your player crouch. Player 2 keyboard controls are the keypad, including diagonals with return as the fire button and delete, crouch. To select between your arsenal of weapons hit both the fire and crouch buttons at the same time to cycle to the weapon you want. This version of Task Force includes a crack by the infamous Joe Hack (Didn't the French just LOVE him! 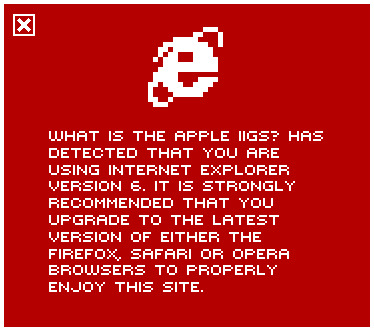 ), which de-protects the game, includes a health booster and allows for the game to be played from a hard drive. Task Force is not an easy game. I've only finished it once without cheating. As a side note, I've never finished it with cheating. I was disappointed to see a very scant ending and an offer to win a free T-shirt if you finish the game before the end of 1990. I finished the game in 1991! If you DO manage to get to the end and face the big boss, use machine gun, tazer and flamethrower before anything else - these weapons will keep him pinned down so he can't fire back. This archive now includes the 'Crude Sounds' version - a hack made by Mr Fresno that includes some good old fasioned over-the-top four letter words, which has been asked for several times over the years, but only recently did Mitch Spector find it amongst his collection.